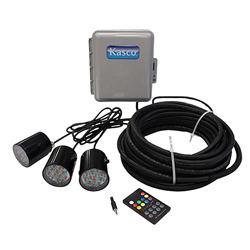 Kasco Marine is pleased to offer Waterglow RGB LED Lighting, the ultimate decorative and/or event lighting for your J or VFX fountains. With the capacity to create 9 different colors, this remote control operated unit also allows the user to adjust brightness levels, has three sequencing patterns, and can be coupled with any music playing device that supports a 3.5mm Y connector (not included with unit.) This affords the user the ability to set the RGB light sequencing to the rhythm of the music! 3 Automatic Sequencing Modes: Flash (jump to next color), Bloom (transition from color to color), and smooth transition (smooth transition from color to color). Rhythmic Sequencing: Music input on the controller allows you to follow the rhythm of music played through your phone, tablet, laptop and more! Settings include fast change, medium and smooth transition.